The IMF today released its Article IV assessment of the Euro area, so as usual, I will be blogging on the issues raised in the latest report throughout the day. The first post looked at debt overhang. 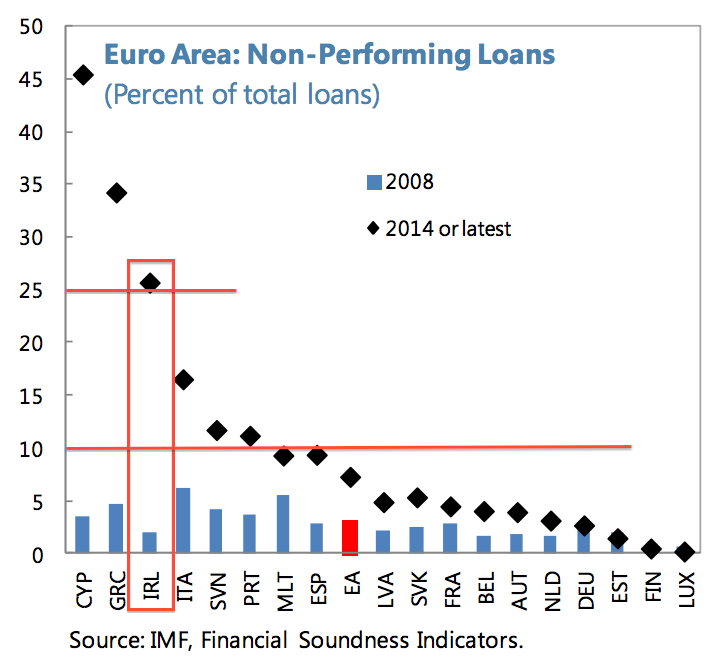 So here, let's take a look at IMF analysis of the Non-Performing Loans on Euro area banks' balance sheets. The above gives pretty good comparatives in terms of the NPLs on banks balance sheets across the euro area. Per IMF: "High NPLs are hindering lending and the recovery. By weakening bank profitability and tying up capital, NPLs constrain banks’ ability to lend and limit the effectiveness of monetary policy. 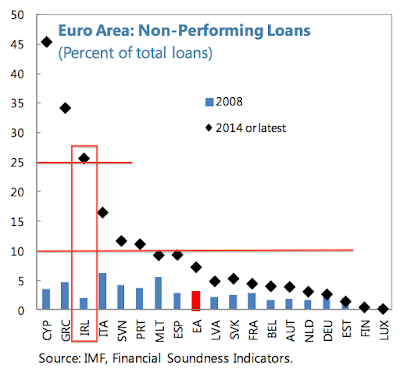 In general, countries with high NPLs have shown the weakest recovery in credit." Accelerate NPL resolution. The SSM should strengthen incentives for write-offs or debt restructuring, and coordinate with NCAs to have banks set realistic provisioning and collateral values. Higher capital surcharges or time limits on long-held NPLs would help expedite disposal. For banks with high SME NPLs, the SSM could adopt a “triage” approach by setting targets for NPL resolution and introducing standardized criteria for identifying nonviable firms for quick liquidation and viable ones for restructuring. Banks would also benefit from enhancing their NPL resolution tools and expertise." So prepare for the national politicians and regulators walking away from any responsibility for the flood of bankruptcies to be unleashed in the poorly performing (high NPL) states, like Cyprus, Greece, Ireland, Italy, Slovenia and Portugal. And in order to clear the way for this national responsibility shifting to the anonymous, unaccountable central 'authority' of the SSM, the IMF recommends that EU states "Improve insolvency and foreclosure systems. Costly debt enforcement and foreclosure procedures complicate the disposal of impaired assets. To complement tougher supervision, insolvency reforms at the national level to accelerate court procedures and encourage out-of-court workouts would encourage market-led corporate restructuring." There is another way to relieve national politicians from accountability when it comes to dealing with debt: "Jumpstart a market for distressed debt. The lack of a well-functioning market for distressed debt hinders asset disposal. Asset management companies (AMCs) at the national level could support a market for distressed debt by purchasing NPLs and disposing of them quickly. In some cases, a centralized AMC with some public sector involvement may be beneficial to provide economies of scale and facilitate debt restructuring. But such an AMC would need to comply with EU State aid rules (including, importantly, the requirement that AMCs purchase assets at market prices). In situations where markets are limited, a formula-based approach for transfer pricing should be used. European agencies, such as the EIB or EIF, could also provide support through structured finance, securitization, or equity involvement." In basic terms, this says that we should prioritise debt sales to agencies that have weaker regulatory and consumer protection oversight than banks. Good luck getting vultures to perform cuddly nursing of the borrowers into health. Per IMF: "NPL disposal can free up large volumes of regulatory capital and generate significant capacity for new lending. For a large sample of euro area banks covering almost 90 percent of all institutions under direct ECB supervision, the amount of aggregate capital that would be released if NPLs were reduced to historical average levels (between three and four percent of gross loan books) is calculated. This amounts to between €13–€42 billion for a haircut range of between zero and 5 percent, and assuming that banks meet a target capital adequacy ratio of 13 percent. This in turn could unlock new lending of between €167–€522 billion (1.8–5.6 percent of sample countries’ GDP), provided there is corresponding demand for new loans. 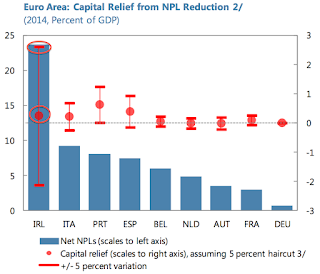 Due to the uneven distribution of capital and NPLs, capital relief varies significantly across euro area countries, with Portugal, Italy, Spain, and Ireland benefiting the most in this stylized example." 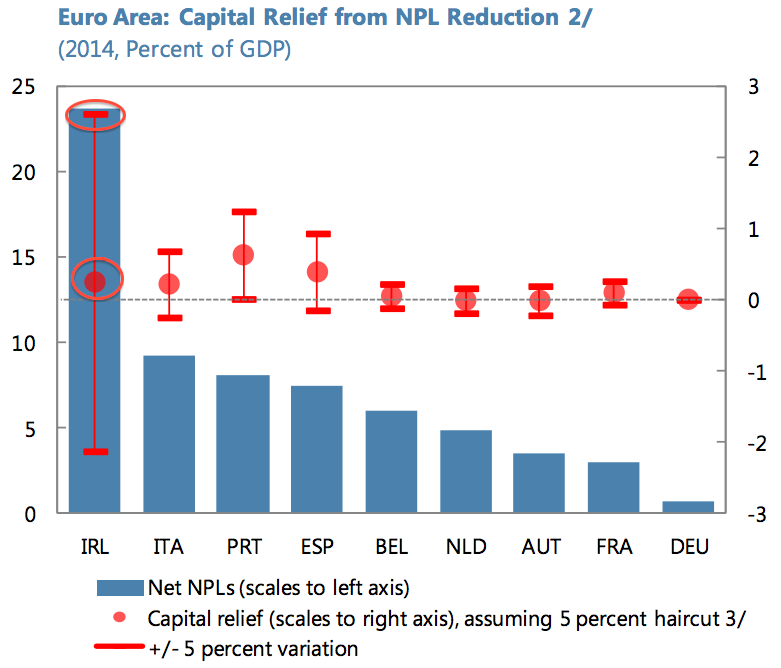 A disappointing feature, from Ireland's perspective, of the above figure is that simply driving down NPLs to historical levels will not be enough to deliver on capital relief in excess of the average (as shown by the red dot, as opposed to red line bands). The reason for this is, most likely, down to the quality of capital held and the impact of tax relief deferrals absorbed in line with NPLs (lowering NPLs via all but write downs = foregoing a share of tax relief). Stay tuned for more analysis of the IMF Euro area report next.